It’s been called everything from the “Crown Jewel” of Oregon Parks, to the most expensive comfort station in Oregon history, but the views can only be called stunning. The Crown Point Vista House at the gateway to the Columbia River Gorge has some of the best views in Oregon and can also give you a crash course in Oregon history to boot. Designed by architect Edgar Lazarus, the 55-foot-tall structure is located on Crown Point, overlooking the entrance to the Columbia River Gorge. 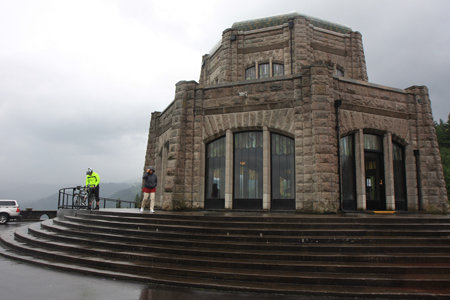 Originally opened as a “comfort station” and a place for drivers and their cars to rest during a drive down the gorge, today Vista House is a memorial to Oregon’s pioneers, an observatory, gifts shop and history lesson. “What amazes me is that they thought to build this place with 20 bathrooms, when at the time there were only about 20 cars,” said Ken Overton, a volunteer with the Friends of Vista House, a group that greets travelers at the historic destination. People come to the Vista House for the amazing view, but it has more to offer. The views down the gorge can’t be stated in words. The sheer beauty of the natural surroundings leaves some people to stand for several minutes taking in the fresh air and cliffs, river, boats, weather and wildlife. As an observatory the Vista House is a wonderful place to watch weather roll down the gorge or look through the telescopes at boat traffic. There is even a balcony which is open to the public, weather permitting, that gives an even greater view from the vista, with access just inside the house. While many people would think that would be enough to visit the historic house and visitor center, there is more to Vista House than the natural views that surround it – there is the history of the house, gorge and state. Eight pillars inside the Vista House has a panel that explains some part of history of the house. One panel, named “Flights of Imagination” which outlines how Richard T. Dabney had plans to make the site a hotel with a gondola that stretched down to the railroad below. A second panel, called “The Building of Vista House,” talks about the construction and controversies of the house. Another panel, called “A Mixed History,” talks about the controversies surrounding the house, and how it was originally paid for by Multnomah County, but later in 1938 was given to the state of Oregon when maintenance costs were too high to keep it up. Yet another panel outlines the honored pioneers of Oregon, from John McLaughlin to Marcus Whitman, to Joseph Lane and Matthew Paul Deady. But the history of the house isn’t the only thing you will find. It’s easy to show up look at the views, walk into the main lobby of the house and then get back in the car and keep moving on down the gorge. Make sure that if you visit the Vista House, to see the basement. Not only is that were the bathrooms are located, down some stairs, or accessible with a new elevator that comes out of the floor, but also a gift shop and displays that show other historic spots along the gorge. You also haven’t experienced Oregon until you get your first taste of the winds that scream down the gorge. Since the gorge funnels weather and wind, you get the most powerful straight wind in the country by some estimates. “We had a wind gauge once, but it blew down,” Louise Yarbrough, executive director of the Friends of Vista House said with a smile. She also tells of local TV reporters who have fallen over in the gusts while on camera, showing just how powerful the wind is. About the Crown Point Vista House (From the Friends of Vista House website): Vista House was built between 1916-1918 as a memorial to Oregon pioneers, as a comfort station for those traveling on the Historic Columbia River Highway and as an observatory. The octagonal stone structure towers 733 feet above the Columbia River, is listed on the National Register of Historic Places and in the National Geographic Society’s 2001 “Save America’s Treasures” book. What to bring: Weather appropriate clothing as the house is on an exposed vista along the Columbia River Gorge. Weather can change from moment-to-moment, so be prepared for wind, rain or even snow in all but the summer months. The picturesque setting is perfect for photography, so charge up those batteries and make sure your memory cards have room. Season: Due to the severe weather that can come through the Columbia River Gorge, during the winter months the Vista House is only open during the weekends, if people can reach it. Normally it is open daily from 10 a.m. to 4 p.m. beginning March 14. Beginning April 19, visitor hours are extended to 9 a.m.-6 p.m. The building remains open daily through Oct. 31. Visitors can stop by any time of year, day or night, but the house will be closed. Getting there: From either westbound or eastbound on I-84, you can reach Vista House by taking Exit 22 (Corbett). From the top of Corbett Hill, go left (east) for approximately 3 miles. Be sure to stop at the Portland Women’s Forum Viewpoint (1.5 miles from Vista House) for a spectacular view of Vista House and the Columbia River Gorge.